If you are using a PC or notebook with Microsofts Windows 8.x (8.0 or 8.1) operating system, Microsoft's own Visual Studio development software is the default option for a fitting development environment (and one of the best). Among the different Visual Studio products Microsofts Visual C++ (MSVC) is the product of choice for programming in the C++ programming language. 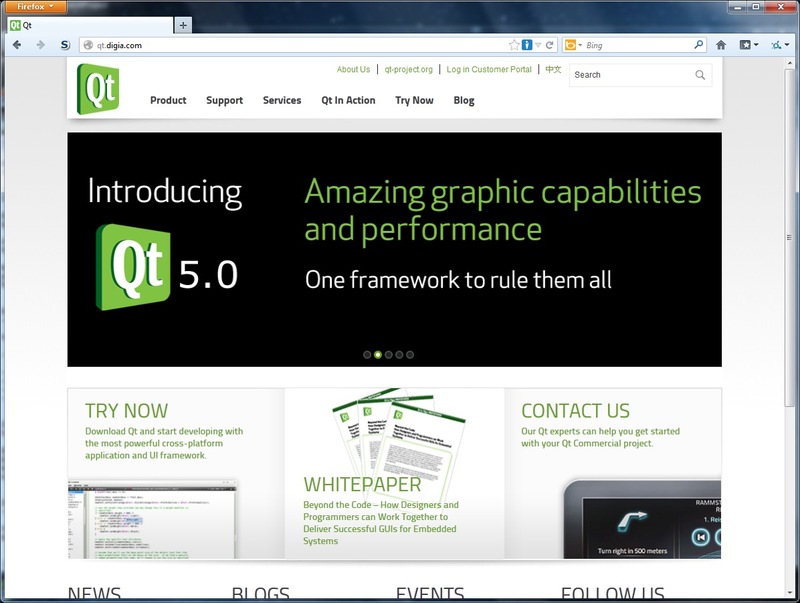 The current version 5.3 of the Qt library supports the 2013 version of Visual Studio C++. In contrast to earlier versions of Visual Studio, the software now includes tools for all supported programming languages for a selected platform. 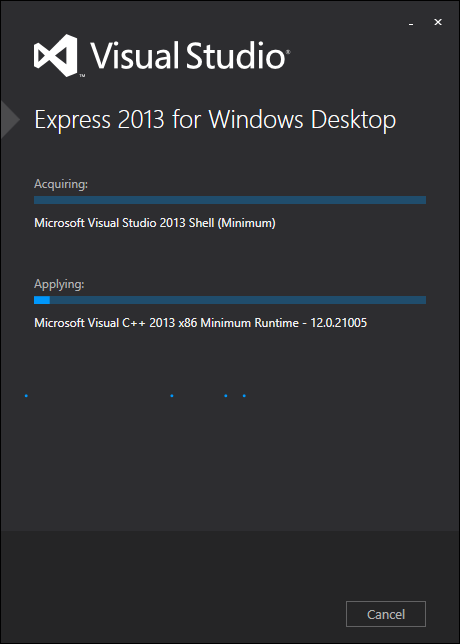 So instead of looking for Visual Studio C++, you just need to get Visual Studio 2013 for Windows Desktop. For this tutorial, we only need the "Express" Version which can be downloaded free of charge. This web page automatically recognizes your system's current default language and displays description texts in the according language, as you can see from the screenshot above, where the texts are in German (because this is my current default language for Windows). Here, you can select one of several available languages. This only affects the texts for the menus, options etc. in the Visual C++ development environment user interface. The C++ programming language is not affected by this (it always uses English keywords). You can also download additional language packs by using the download links on the right side of the page. Once you have selected your language of choice, you can click on the "Install now" link, which is the first link and button in the "installation options" section. 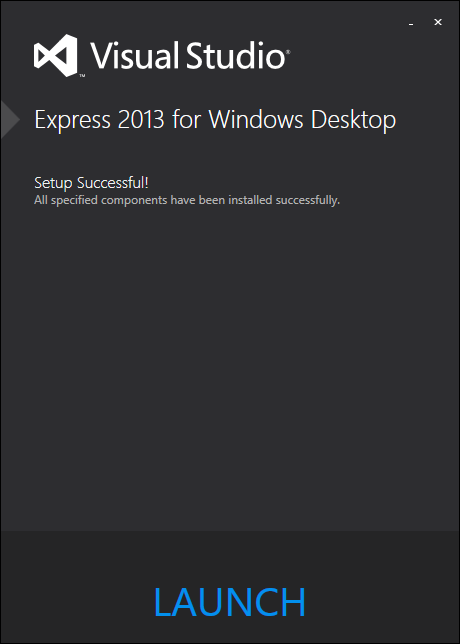 This will start the download of a small installation program named "wdexpress_full.exe". 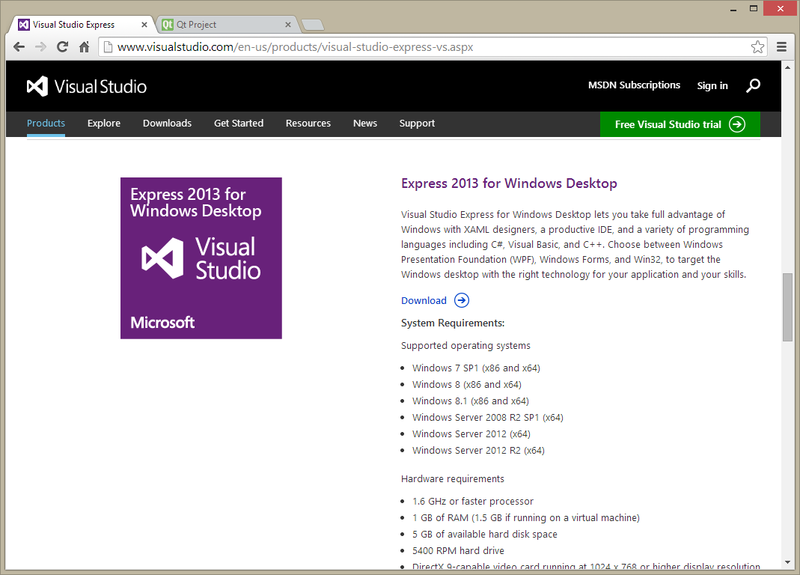 This installation program can then be used to start the download and installation of Visual Studio Express 2013 for Windows Desktop. Alternatively, you can choose to download the DVD image with the installation software using the second link. If you do that, you need to burn the downloaded image to a DVD or mount the image as a virtual disk in order to start the installation program. Currently, clicking on the download link will open up a series of dialog screens before the actual installer is downloaded. 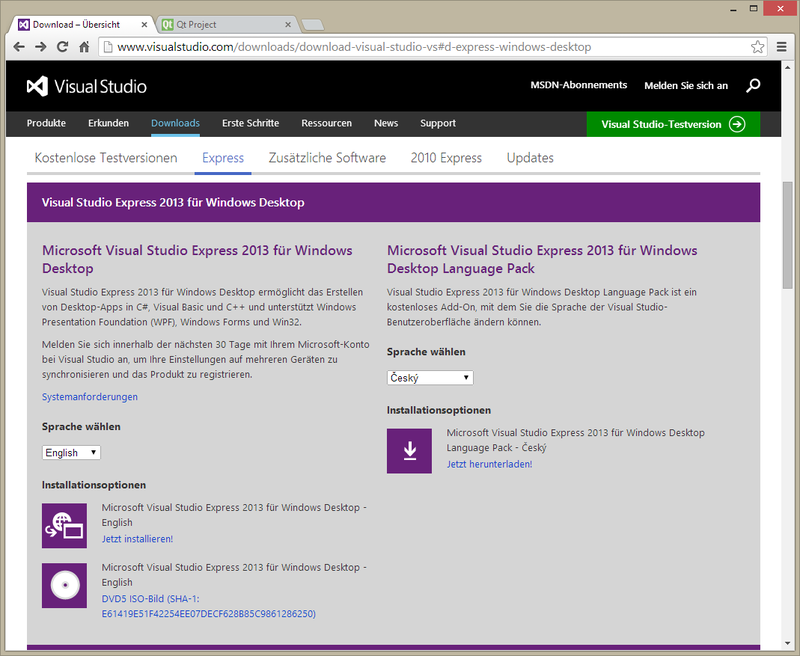 You need to create a developer account in order to use the 2013 version of Visual Studio Express, or at least register your Microsoft account (Live account) as a development account. This allows you not only to receive related news and updates, but also to use the software to create applications for the official Windows Store. Your e-mail address from the Live account which you use to log in to your Windows desktop will usually appear in the contact e-mail field automatically. You only need to enter your name and your country or region here. While you can also create a Visual Studio Online account - which is needed for official Windows App Store development - we do not need this for this tutorial. The download of the online installer or the disk image should start now. If you haven't already done this, you are offered the option to create a Visual Studio Online account for the Windows App Store development. As before, this can be skipped as it isn't necessary right now. While I have documented the installation process for the online installer below, the process and the dialogs will be the same if you use the installation program from the disk image instead. On the disk, there should be a program named "wdexpress_full.exe" or "install.exe" which you need to start in order to install the software. If you used one of the "install now" download link from the Microsoft Visual Studio Express website as described above, there should now be a small online installation program (usually "wdexpress_full.exe") in your download folder. You can agree to join the improvement program for Visual Studio by also checking off the second option (which is active by default), or you can deactivate this by clicking on the related box in order to un-check it. Depending on the speed of your online connection (or the speed of your disk drive if you use the disk image), it might take some time for each of the components to be downloaded and installed. 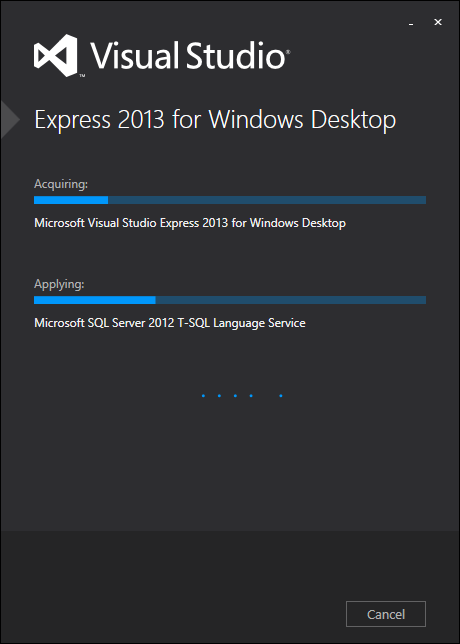 With a successful setup, you can now start Visual Studio Express 2013 for Windows Desktop by clicking on "Launch". 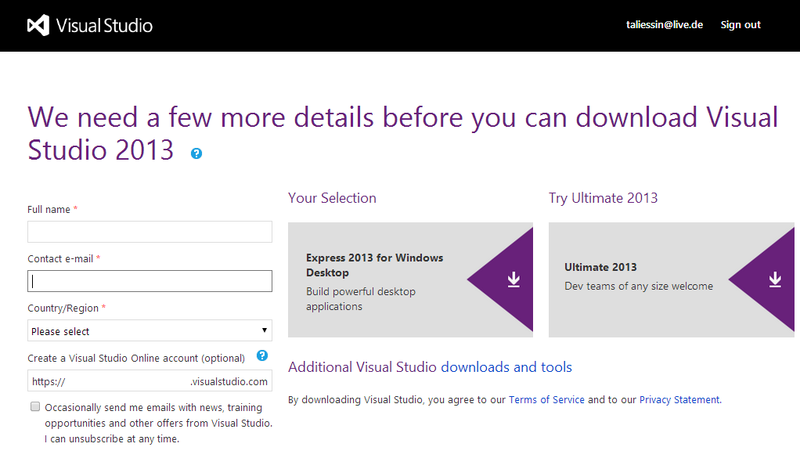 At the first startup, you will likely be presented with some additional infos and dialogs, where you can connect the installation with your development- and Visual Studio Online accounts. 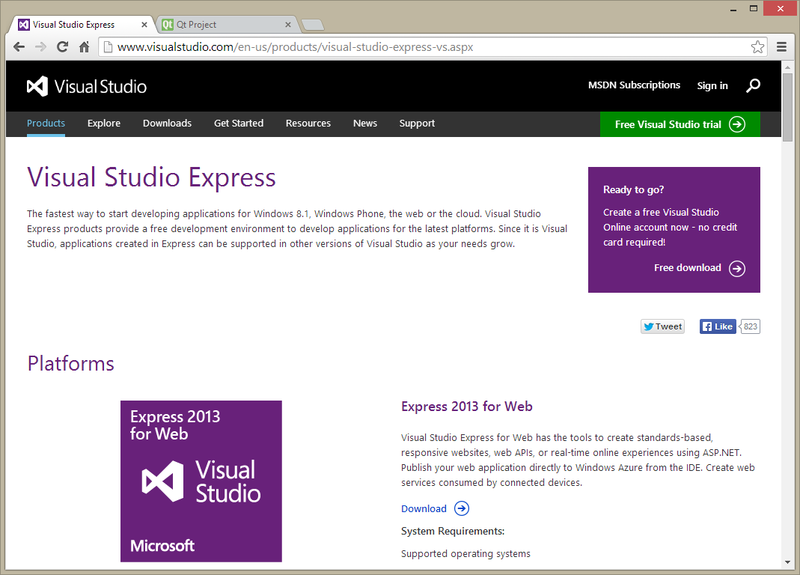 After these initial steps, the Visual Studio Express software can be closed. 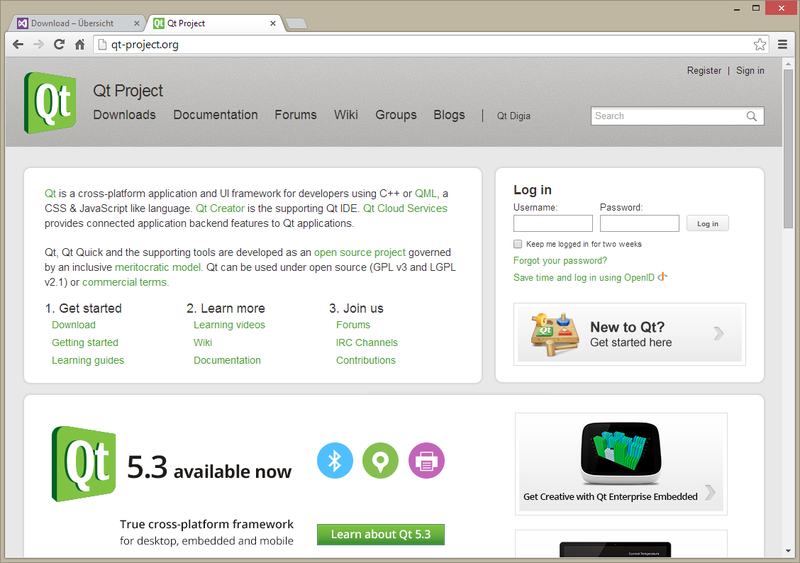 For the rest of this tutorial, we will use the Qt Creator IDE instead of the Visual Studio IDE. 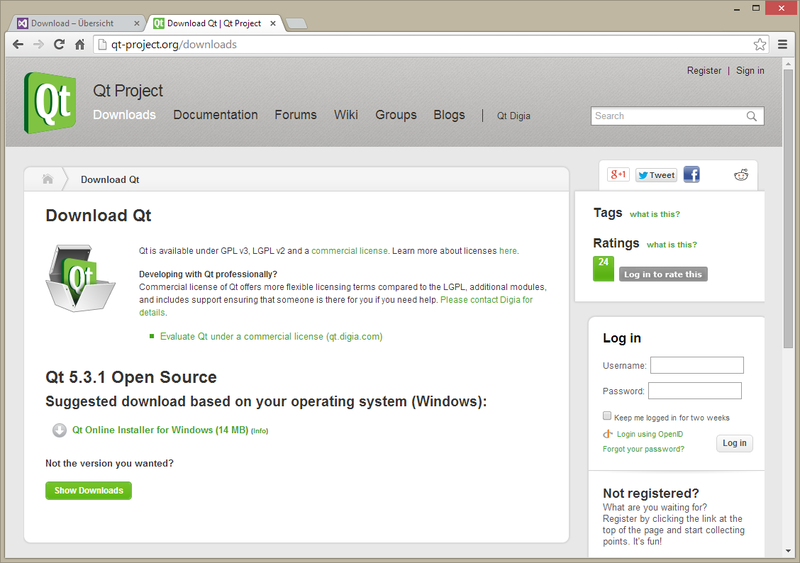 The current version of Qt is 5.3 (at the beginning of July 2014). This version to offers full support for mobile platforms. Unless Qt is updated to version 6 (which may contain bigger changes), it is usually no great problem to install smaller updates. For this tutorial, the small changes represent no problem. The default option here is the download of the Qt online installer for your operating system, which will download and install all tools and libraries without their related source code. Alternatively, you can download an offline installation package and choose to also download the source files. In this case, the name of the installation software reflects the Windows version and C++ development environment it is targeted at. For example, the offline installation program for Visual Studio 2012 for 64-bit Windows versions is named "qt-opensource-windows-x86-msvc2012_opengl-5.3.0.exe". 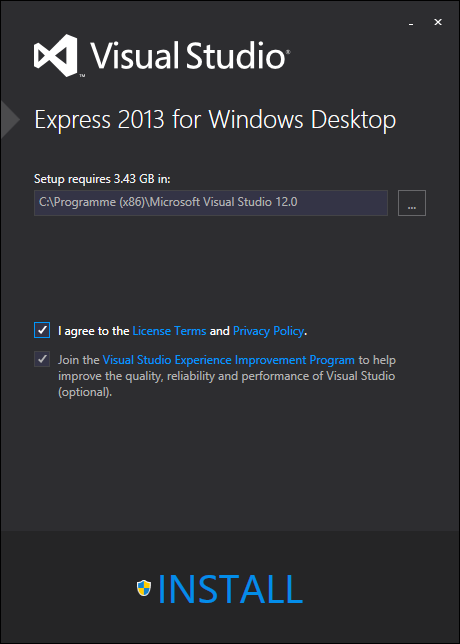 In any case you need to choose the right version of Qt for the C++ development software you already downloaded and installed - in our case, the version for Visual Studio (Express) 2013.